The first weekend in April saw over 400 of the most talented young athletes from across the UK compete at Sportcity, Manchester in the finale to the 2014 Sportshall season. This key fixture in the calendar of many aspiring athletes was successfully staged in Manchester for the first time this year with the compact arena creating a great atmosphere across the two days of competition. Taking place on the Saturday, the Under 13s Team Challenge competitions were formally opened by the creator of Sportshall Athletics, George Bunner MBE. The Under 13 Boys of Avon took their title with 1340 points with a series of impressive relay performances making a difference with Surrey Boys in second and Birmingham in third place. The Under 13 Girls title went to Hampshire for the third successive year. The champions won with 1254 points, Avon Girls in second on 1204 and Birmingham in third on 1190. 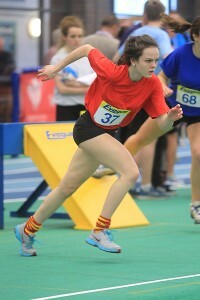 The Sunday saw the opportunity for the Under 15 athletes to compete. The U15 All Rounder Individual competitions, were won by Ellie Hodgson from Hampshire and Ashley Cooper from Norfolk. Ellie and Ashley join an illustrious group of recipients which includes Mark Lewis Francis, Kelly Sotherton and Jade Surman. After the success of the Hampshire Under 13 Girls the day before, it was another South East victory in the U15 Girls competition as Surrey triumphed with 1262 points. Birmingham came in second on 1217 with Norfolk in third on 1190. The Norfolk Boys team were crowned champions in one of the closest Under 15 competitions ever with just 4 points separating the top 3 teams. Norfolk Boys accrued 1250 points, with Birmingham 1 point behind and Hampshire just 3 points adrift of Second on 1246. The organisers would like to thank all the athletes, team managers, parents, helpers and officials for making the 2014 Sportshall UK Final so memorable. A special thank you is reserved for Manchester City Council, the Amateur Athletic Association and Eveque whose help and assistance was invaluable. For full results or more information on the programmes please visit www.sportshall.org or follow on twitter @SportshallUK for regular updates.